Beautiful! I like the paintwork. Slippery Hydroplane Raceboat, 1940, Scale: 1:24 The Slippery is a 135 c.i. class hydroplane racer circa 1940. The length is 14 feet, 2 inches. The boat was designed by John L. Hacker. Plans for the Slippery were published in COMPLETE DESIGNS FOR 44 MODERN BOATS, Motorboating Ideal Series Volume 18. The model is scratch built, plank on bulkhead method using pear wood. Electro plating was done with Caswell Copy Chrome. The engine is a Gray Marine Phantom 4 racing engine. It is scratch built from boxwood, brass and styrene. The spark plugs were cast from resin. 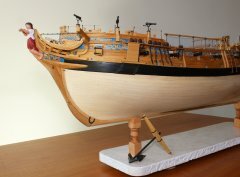 This is my rendition of the English Pinnace (circa 1750-1760) kit by Model Shipways. Scale is 1:24. The paint scheme was inspired by a contemporary model in the National Maritime Museum in Greenwich.